It might not support mesh networking, but the TP-Link Omada ticks all the boxes for those needing to provide outdoor wireless connections quickly and with a modest budget. There is a fine irony in placing wireless networking solutions inside buildings when they work so much better on the outside. However, most access points aren’t weatherproof. The market for externally mounted wireless technology has blossomed in recent years, as companies have discovered the value of providing good external connections, along with the ones inside their properties. 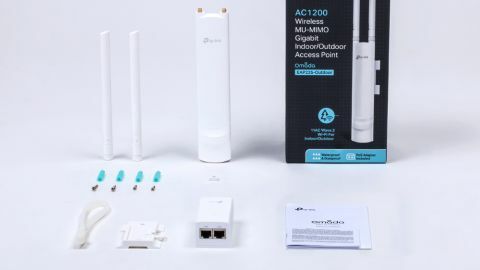 Focusing on this area, TP-Link developed a range of wireless networking products designed for the great outdoors, and today we’ll be looking at the AC1200 Wireless Outdoor Access Point from its Omada range (product reference EAP225-Outdoor, and we’ll call it the EAP225 for short). In the UK the EAP225 has an RRP of £99.99 and can be found on Amazon for a couple of pounds less than that. A typical US price is around $85, and we found it for close to that on Newegg, and even cheaper at Sears and on Amazon. While that makes the EAP225 highly affordable, there are similar alternative products around this price, like the Ubiquiti UniFi AC Outdoor Mesh solution. That product supports a Mesh mode, which is the one feature missing from TP-Link’s offering. But compared to rival Wi-Fi equipment designed for outdoor use, the EAP225 is highly affordable. To be honest, the EAP225 looks like a high-technology upgrade for Harry Potter’s wand. With antenna attached it’s about 40cm long, and comes with a small mounting plate designed to be glued, screwed or tie-wrapped to some hopefully immovable piece of architecture. TP-Link also has a standard EAP225 that is meant for mounting internally on a wall or ceiling tile, and there isn’t any reason why you couldn’t do the same with the EAP225 if required. Both antennae can also be replaced with alternative designs to the omnidirectional types TP-Link included, should you need a specialist enhancement. The only other moveable part of the EAP225 is a small access plate on the bottom end that provides a weatherproofed entry point for a single Ethernet cable. There’s a flaw here, however, as the hole for the cable to enter is directly underneath, and not rear facing. And, therefore, it isn’t possible to install an Ethernet cable without it being visible. That explains the data path, but not how the unit is powered. In this respect, TP-Link used a tried and tested technology that is gaining popularity on many networks. A problem for any network infrastructure is when equipment is needed where there are no services, specifically power. Running a network cable is easy, but having a power socket placed in a roof space or similar location can be a time-consuming and costly exercise. However, there is a technology called PoE or Power over Ethernet, whereby a limited amount of power can be piped alongside the data down the wires in an Ethernet cable. It’s possible to supply enough juice to power a security camera, or in this case the EAP225. You get a small power adapter with a combined Ethernet port in the box, and this can be split out at the end of the network cable that is connecting to a switch. Alternatively, if you have a series of these devices, you can buy a PoE-capable switch, which automatically detects that a PoE device is connected at the other end and sends power to it. Using this method isn’t especially radical, but it does make the EAP225 very easy to deploy for any business that can screw a bracket to a wall and run an Ethernet cable through a building. With two antennas this access point can operate a 2x2 MIMO configuration with 1200Mbps total bandwidth quoted. That number is expanded a little from the 300Mbps that 2.4GHz provides and the 867Mbps that a single 5GHz channel offers, at least theoretically. As the total wired bandwidth is less over Gigabit Ethernet, having much more would be pointless for those devices using the connection for internet access. For those that only have one EAP225, TP-Link provides a mobile app that enables you to configure a standalone device. But if you have more than a single EAP device, TP-Link also has the sophisticated Omada Controller software that’s free to download and install on Windows and Linux. This package contains the latest firmware updates for the EAP devices, and also detects and launches the web interface for you to manage multiple EAPs and the clients connected to them. This interface allows you to make global changes with just a few clicks, even with EAPs deployed in different locations. The power of this software is that it can monitor the performance of each device in real-time, highlighting when they’re oversubscribed. Within the EAP225 you can also define multiple SSIDs – 16 in total – allowing you to grade users at the SSID level and have stratified security that is department or function-based. For the majority of users all this is overkill, but for those who need extensive management tools, this is a blessing. Wi-Fi range and performance are dictated by the frequencies used, as each drops by a different amount over distance, and has differing bandwidth abilities. 2.4GHz delivers substantially better distance coverage whereas 5GHz has superior bandwidth at a shorter range. By default, the AP merges 2.4GHz and 5GHz into a single SSID, but you can configure this to break them out separately. For assessments, we decided on line-of-sight tests using an Ultrabook and an Android smartphone, both with 802.11ac Wi-Fi connections. At less than 100 feet, we experienced 433Mbps connections reliably, and that only dropped at 200 feet to 250Mbps. Outside of line-of-sight, on the other side of the building, we still managed 55Mbps downloads. Curiously, in many of our tests, upload speeds remained consistently around 80Mbps, almost irrespective of distance or obstructions, suggesting that the default mode uses 5GHz as the preferred download channel and 2.4GHz is the preferred return path. In the previously mentioned Omada Controller software, you can activate load balancing, and also cap the maximum number of users per channel to maintain performance levels. If anything, the EAP255 reminds us that Wi-Fi works best in open spaces, even if we often insist on using it indoors. Within the context of 2x2 MIMO, the speed of this equipment is good and the range covered would work well for recreational areas or outdoor dining. For the modest asking price, there is very little to dislike about the EAP225. It’s easy to deploy, configure and manage, and very few business networking products are this straightforward. It isn’t a mesh solution, but not everyone wants that feature anyway.